Hi everyone! I’ve posted several of our smoothie recipes before, and today I wanted to share my kid friendly Green Smoothie recipe! We’re always experimenting with smoothies here, and we drink them almost every morning. Turbo is our resident smoothie expert, and since we drink them frequently he’s been working out a recipe that tastes both great for kids and makes mama happy! This recipe is a nice bright green color which I’ve found helps when convincing kids to drink something that is good for them. The above recipe is one we’ve decided is our favorite, but really you can make your own combination. Here is a handy chart to help you out. If you’re trying to get kids to drink these, I recommend starting out with the ratio below. Having more fruit than greens will help it taste sweeter and can convince even reluctant little ones to give it a try! When blending green smoothies I really like to blend the liquid and greens first. It really helps get the greens blended well so there aren’t any “chunks” of spinach in your smoothie. So first add your liquid to your blender. This will help it from getting bound up when pureeing the greens. You can use 2 cups of anything you like, we normally stick to water or coconut water. You can also use low sugar orange juice, it’s just not quite as healthy. But it can help get your little ones to drink it since it adds a nice sweet flavor to hide bitter taste of the greens. Next add in 2 cups of leafy greens. We like to use spinach and sometimes romaine if I have it. Kale is also a great source of nutrients, however my kiddos don’t like it’s bitter taste, so if I’m making it for them I usually just stick to spinach. 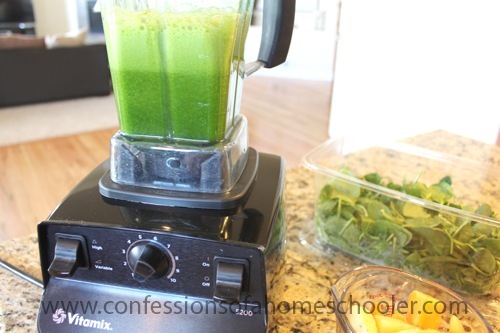 Blend your liquid and greens well until the mixture is nice and smooth with no chunks. We got a Vitamix for Christmas and absolutely LOVE it! This thing can blend up absolutely anything! 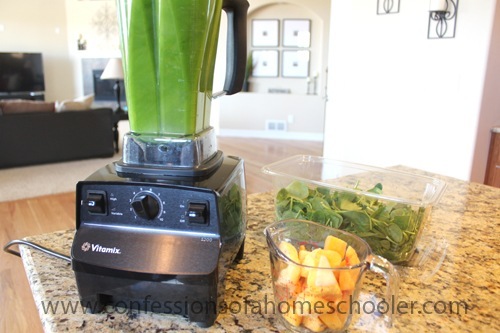 But if you have a regular blender just take it slow, you may have to add in your greens a little at a time if your blades are getting stuck. Once your greens are blended well, add in your fruit of choice. We like to use mango and pineapple. I also add in a banana to help sweeten the mix sometimes since we’re not using any artificial sweetener. Be careful though, banana can be a strong flavor. You can also add in an orange for some additional sweetness if you like. If you want to keep this nice green color, stick to fruits that are yellow or orange. While I like to add in raspberries, strawberries, and blueberries, they will turn your mixture a brown color. This can be slightly difficult to drink for kids, and even me sometimes! 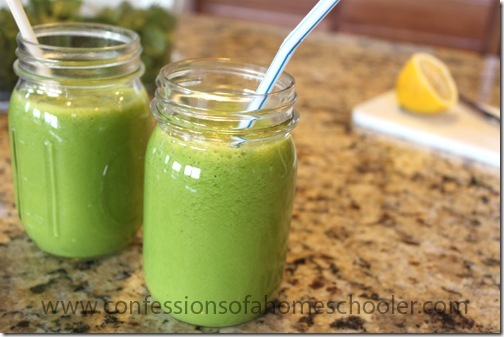 Serve your yummy smoothie in a fun glass and enjoy! So that’s our latest green smoothie recipe! Everyone liked this one right off the bat, so we’ve been making it for awhile now. Turbo likes to try new things, so we’ll probably have a new concoction to share with you again soon! But for now, we hope you enjoy this one! Added bonus: The ingredients in this smoothie are excellent for your overall health. 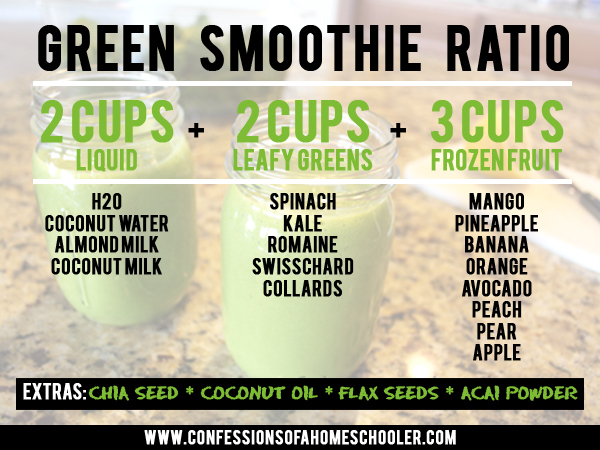 And for all of you with a sugar addiction like me, you’ll be happy to know that this smoothie also reduces your craving for sweets! Yipee! Are you using frozen fruit? You say fresh fruit which sounds like it’s not frozen but I’m wondering how you get the cold smoothie consistency since I don’t see ice mentioned. We found that a cup of Greek yogurt really helps the colors with berries! 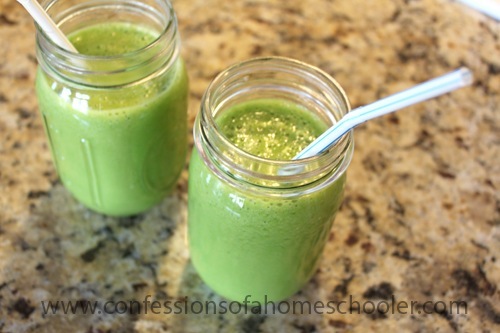 Your smoothies helped me to lose weight and for that I am thankful and appreciate you GREATLY! May God/Allah bless you and yours abundantly! 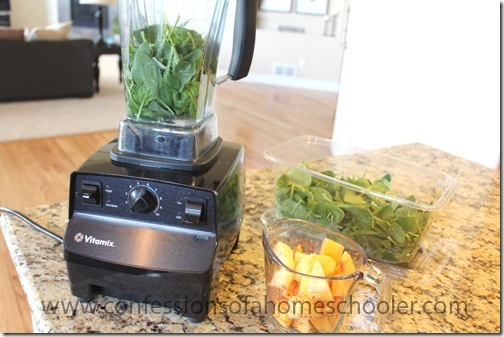 We just started homeschooling this year and doing green smoothies! WE LOVE them both! 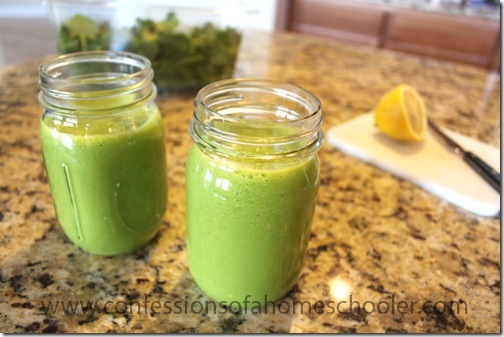 Have you ever heard of the green smoothie girl? I should share some of our favorite recipes and tips with smoothies… I don’t have a lot of those for homeschooling yet but I sure love coming to your site to get great ideas. Thank you for your inspiration. My son (6) calls them his Hulk drink. To make him as strong as the Hulk. I also add parsley( good for detox) and sorrel. The sorrel gives a nice tang. Sounds delicious!. Do you know how many cups of smoothie the recipe yields. I want to make this for a nutrition fair enough for 60 kids to sample it. Thanks!